On October 4th & 5th, an international donor summit of 70 countries met in Brussels to work out financial assistance to Afghanistan. Over the next four years, they pledged US$15.2 billion; of that, the EU & its member states pledged US$5.6 billion (€5 billion). After a year of secret negotiations, EU officials muscled the Afghan government into signing the EU-Afghanistan Joint Way Forward on Migration agreement at the donor conference. This vile agreement demands Afghanistan accept an unlimited number of Afghan refugees denied asylum & forcibly deported from Europe in exchange for the financial assistance package. Last year, over 196,000 Afghans applied for asylum in the EU; so far this year, 128,000 have filed applications. Many Afghans did not apply & live in the shadows as undocumented refugees. This unsavory, ruthless agreement follows the EU deal last March which awarded Turkey US$6.6 billion (€6 billion) & visa liberalization to Turks in exchange for accepting deported Syrian & other asylum seekers. The Afghan elite also derive an incentive package in the EU-Afghan agreement, including special scholarships to students & researchers at European universities. The US-NATO war & occupation of Afghanistan have devastated the country. As of August 2016, the UNHCR estimated there were 1.2 million people internally displaced by the war. Pakistan has been working with UNHCR for a few years to deport Afghan refugees living there & plans to deport all of the estimated 3 million living there, many since 1978. If the country were in any kind of condition to accept hundreds of thousands of deported refugees, there would be no need for a multi-billion dollar aid package. But as soon as the agreement was signed on October 4th, the EU had everything in place to start deporting immediately. The most detestable thing of all is that the US & NATO countries still have 13,000 troops in Afghanistan, unspecified numbers of mercenaries & CIA operatives, & the US is still conducting daily bombing sorties over parts of the country. Thousands of civilians continue to be killed, maimed by land mines, displaced by bombing. It is one of the historic failings of the international antiwar movement that it has not been able to stay the hand of US-NATO military aggression in Afghanistan. Our deepest regrets & fullest solidarity with the people of Afghanistan who have paid such a price for political disunity. 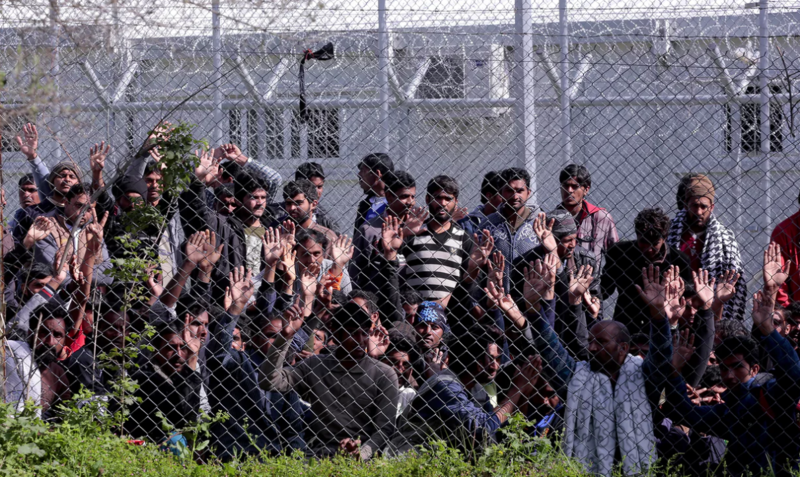 The photo is Afghan refugees incarcerated at Lesbos, Greece. 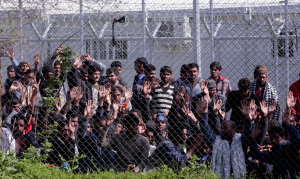 Very early in the refugee crisis, Greek authorities began pulling out Afghans & holding them in squalid detention centers. It’s the vogue now to choose your political loyalties mainly to counter where US alliances are–or where you think they are. The distinctions between words & deeds get all mixed up. That works on the protoplasmic level but not for complex organisms like human society. If there is a US grand design, it is precisely to strip countries of agency by destroying every vestige of popular democracy. Sometimes, but rarely, that includes eliminating strong-man leaders they think unmanageable. Historically the US works very well with autocrats. It’s not an issue. But to regime-change alarmists, it is solely to remove autocrats & to make that case they morph dictators like Assad into champions of the people. He’s just too stylish & western to be an autocrat who tortures people to death. 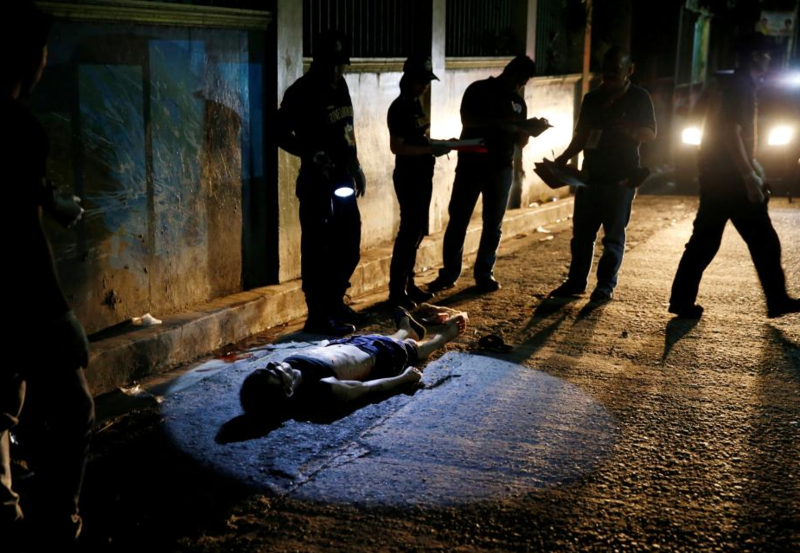 This is the body of Herman Cunanan who Manila police say was murdered by two unidentified men in a drive-by vigilante attack on drug users. The investigation into the murder will dead-end & young Cunanan will end up no more than a police statistic since Philippines president Duterte encourages vigilante executions of poor drug users & street peddlers. Disregarding his criminality & shamefully ignorant of Filipino politics, many Assad supporters have taken quite a shine to Duterte. They think of him as a hero, a Clint Eastwood kind of guy, for talking trash to US power. It’s too bad some people come of age unable to distinguish the grandstanding of blowhards–especially when the distinctions include mass murder for drug addiction. Pepe Escobar, who is really taken with Duterte, gives him highest praise because Duterte has “REALLY got balls” for blowing smoke at US power. “Balls” is not a concept found in political theory but it is commonly encountered in barrooms & locker rooms. Is that where Escobar learned his politics? Because he missed the part where democracy entered history & rulers no longer had the right to shoot down subjects in cold blood. He missed the part about human rights for the dispossessed. Why else would he be so cavalier about the lives of poor people shot down because they could not cope with massive inequality & could find no way out of suffering but through addiction? Duterte is already backpedaling on his grandstanding about separating from the US. Filipino oligarchs have billions invested in a political, economic, & military relationship with the US & they are not going this let this loud-mouthed, psychotic punk undo that just to strut his ‘REALLY big balls.’ If you don’t understand that, perhaps you should consider not writing political analyses & take up hoola-hoop competitions instead. Meanwhile the families of those assassinated are left to grieve. We stand with them & with those protesting Duterte’s death squads. That is where justice lies. Our condolences to those families & solidarity with protesters. May Herman Cunanan RIP. It’s so easy to lose your bearings today when you come up against the cacophonies & confusions of politics. Who can you believe anymore? Nobody wants to stand with the oppressors accidentally only because their lies get better press than the truths of the oppressed. There is no golden measure for how to unravel social & political complexities. It’s been an issue of dispute among philosophers & historians for a few thousand years. Method matters but there are some red alerts, some things that signal where justice & injustice lie. First would be the use of militarism & bombers against civilian populations. The most important freedom struggles in the world don’t have a single bomber between them. Rocks & slingshots are the best they can come up with to back their indomitable spirit for justice. Second would be where & whose children are being harmed? Sounds so sentimental, even simple-minded, but can you think of a single place on Mother Earth where one cannot distinguish oppressor from oppressed by answering that question? Not in a world where the welfare of all children is the only gold standard for justice. 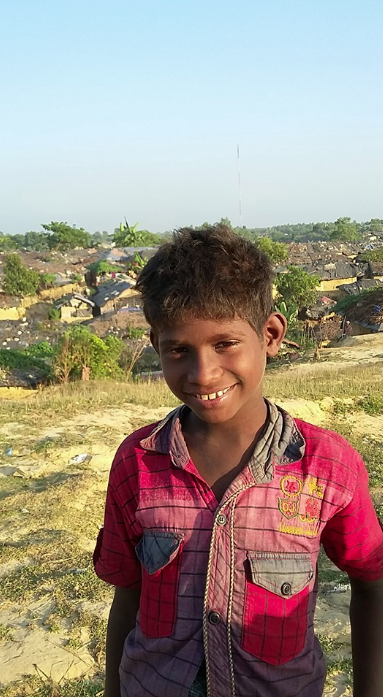 This young boy is 10-year-old Anuwar, a Rohingya refugee living in an unregistered camp in Kutupalong in Cox’s Bazar, Bangladesh. His dad is a day laborer & his mom stays home with him & his 3-year-old brother. He can’t go to school because the UNHCR does not provide formal education or any other assistance to unregistered refugees. They can get elementary education in community-run learning centers but an elementary education won’t take you very far in getting out of poverty–especially in a country where you are a refugee & have no citizenship rights. But of course Anuwar’s real handicap is being Rohingya. Tens of thousands of children denied education, clean water, adequate food, decent housing, safe living conditions, only because they are Rohingya. They always say one of capitalism’s chief merits is its creativity. Myanmar capitalism & all those foreign investors & supporters are going to have to draw on that exhausted, if not also mythical, merit to invent justifications for the continuing genocide & persecution of Rohingya in Arakan State. Because Rohingya activists in exile are now taking it on internationally. Let’s be frank: many political speeches are tranquilizing & I don’t mean of political unrest. But this speech by Kashmiri leader Syed Ali Geelani (who is in his late 80s) is not one of those. Early on in this current military siege, he was banned from FB but has remained very active on Twitter with invaluable posts about what is going on. People my age want to be like him when we grow up. 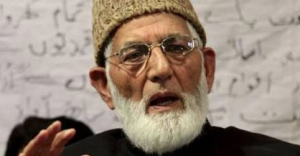 Zíæûlhãq Mohammad, who posted this speech, explained that Geelani has been under house arrest since July 8th (the beginning of the siege), is not allowed to speak to media, & his press releases are banned. His son Naseem was denied permission to visit his father yesterday & an older brother Nayeem was arrested today. Thank you, Zíæûlhãq, for the information. 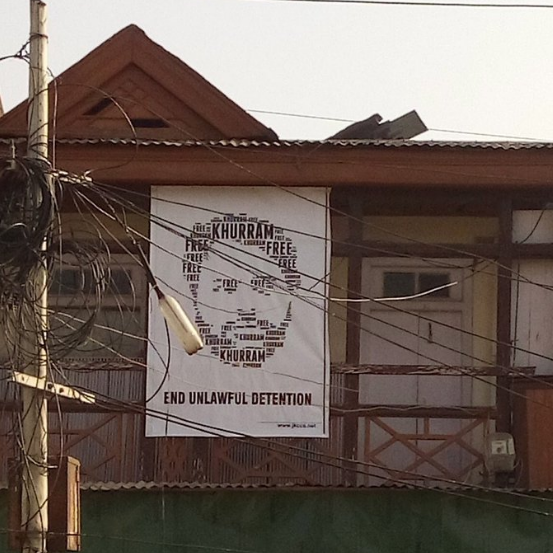 Khurram Parvez has been incarcerated since September 15th. He is a serious, responsible political person who is measured & not the least bit inflammatory in his language. The only reason he’s in jail is to obstruct the human rights investigations & organizing work he headed in Kashmir & his international initiatives over the issue of forcible disappearance. Defending him is primary because of the experienced role he would be playing now for those thousands being arrested & administratively detained in the current military siege. But there’s another reason. India picked him up for indefinite detention to signal to activists that no one is beyond their reach no matter how internationally renowned. It’s not a matter of big shot versus little shot but of defending those whose leadership has been fearless & resolute with unquestioned commitment to ending the violent occupation. Children & youth are directly targeted with the sole intention of destroying the struggle for self-determination by terrorizing them into passivity, disabling them in some capacity to weaken resistance (the Indian government is not avant-garde on the toughness of disability rights activists), or silencing them through torture, indefinite detention, disappearance, or death. Picking off an experienced leader is part of that. We should not feel assured that Khurram is too well-known to be harmed in incarceration. Many leading activists, like Mandela & Mumia Abu Jamal, spend decades in jail; many like Steve Biko, have been murdered in custody. Being dilatory in his defense or defeatist that international pressure can get Khurram released puts him in serious danger along with the thousands of activists recently picked up in home invasions & at street protests. His defense is how human rights advocates around the world can play an essential role in the struggle against the occupation of Kashmir.